Most of us have our favorite go-to blogs that we check on a daily basis, but with over 175,000 new blogs created every day, finding fresh blogs that are well-written, relevant, and appeal to our passions is no easy feat. As you know, Six Apart is a company founded by bloggers, for bloggers, and because of that, we want to not only provide bloggers with the best tools, but also help them reach a broader audience. We realize, however, in order to do the latter, we have to help readers find the best content available on the web. We hope the newest addition to the Six Apart family, Blogs.com, will do just that. Blogs.com is a guide of the best blogs on the web (including lots of TypePad blogs! ), picked by a passionate group of editors and organized by topic. You’ll find blogs on a variety of topics ranging from Entertainment, to Technology, to seasonal topics like Student Life. You’ll also find the latest buzz on the web in featured editorials updated throughout the day, in top ten lists organized by category, and in the Blogs.com newsletter, which delivers highlights from the entire blogosphere fresh to your inbox every week. Wondering how you can submit your blog to the Blogs.com editors? It’s easy - just fill out this quick form. In the meantime, check out Blogs.com and let us know what you think. 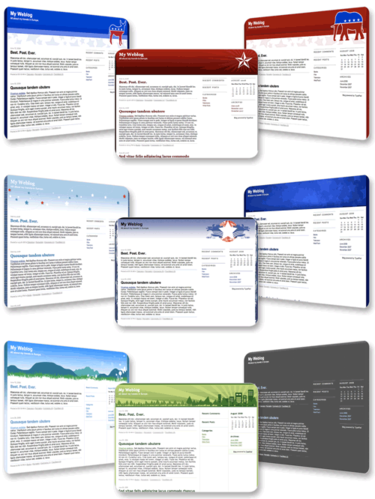 Our design team just added over 40 new theme choices. Show your patriotism with stars and stripes, or you can get downright political by choosing the Democrat or Republican themes. There are even two green cityscapes that are rather eco-friendly - blogging does save trees, after all. For the minimalists, we added Basic themes in over 20 color choices. Those of you with Pro, Premium and Business Class accounts can choose one of these Basic themes and add your own banner to it with our Custom CSS feature. Check out TypePad team member Andy Wibbels' how-to posts about using Custom CSS to change your blog's banner and background.